Cheesecake brownies are such a great treat. 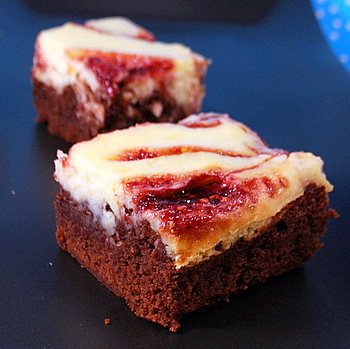 They have a wonderful combination of flavors and textures, and even though they’re usually quite rich, the balance between the tangy cheesecake and chocolaty brownie makes them seem light. Classic vanilla cheesecake is the default topping for these, but there is no reason that you can’t branch out and try other flavor combinations here, just as you can with regular cheesecakes. For this batch, I added in a swirl of raspberry preserves to the cheesecake topping, creating raspberry cheesecake brownies. Raspberries go very well with both chocolate and cheesecake. I picked raspberry preserves that had seeds, but no big chunks of fruit. Any type of preserves or jam will work well for this recipe, including ones with big chunks of fruit (if that is the style of preserve that you prefer), although I think that relatively smooth preserves work best. 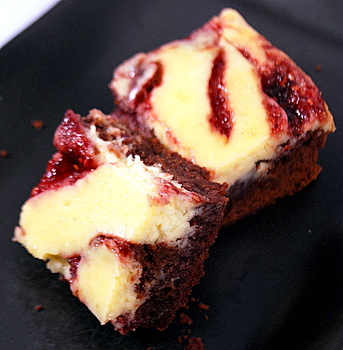 The raspberries added some juiciness and extra sweetness to the dessert, as well as a lovely swirl of color to break up the black-and-white of the plain cheesecake brownie. The brownies themselves are a little bit chewy and a little bit fudgy, a good contrast for the tender, melt-in-your-mouth cheesecake topping. Resist the urge to swirl the raspberries into the brownies and keep most of it in the topping. The color of the raspberries will be lost in with the chocolate batter, and the flavor contrast is much more noticeable when the raspberry swirl is primarily confined to the cheesecake layer. In a large bowl, whisk together sugar, eggs and vanilla extract. Whisking steadily, pour chocolate mixture into sugar mixture. Stir until smooth. Sift flour, cocoa powder and salt into the bowl and stir until just combined. Pour into prepared pan and prepare cheesecake mixture. In a medium bowl, beat cream cheese, sugar, egg and vanilla extract until smooth. Drop in dollops onto prepared brownie batter. Drop dollops of raspberry preserves into the cheesecake batter. Gently swirl batters with a butter knife, giving the brownies a swirly look. Cool in the pan completely before slicing and serving, either at room temperature or chilled. Makes 20 brownies (or 25 small brownies). Wow! These look so delicious. The raspberry makes a gorgeous visual contrast with the cheesecake, too. Yum! I love you for posting this. I was just trying to figure out what I wanted to make for someone’s bday tomorrow at work and I now know EXACTLY what I want to eat lots of while being hopelessly crazy at work. I made something similar last summer for a potluck and they were great! Love the picture. Your recipes are awesome! This looks delicious! It might be just the thing for a Valentine’s day treat. OMG,LOL I just ate a piece of cheese cake 2 min. ago and Im sorry now that it wasnt this one. This looks super yummy! I can’t wait to try it out! Hope your Valentine’s Day is great. I hope it’s quite a treat. I hope you have a happy day filled with things so sweet. well, you’ve done it! you’ve put two of the best desserts ever into one scrumptious concoction, and i just can’t wait to try it! your cheesecake brownies look sublime! Looks yummy!! I love cheesecake and brownies! Wow, you’ve got to quit posting pictures like this. I almost licked the screen! I made these for my husband, for Valentine’s Day. HUGE HIT. Thank you for the inspiration. Oh my, these were fantastic! Thanks for the recipe. Oh my. I made these last night for my book club group. They were amazing! I will definitely be making these again. Many thanks for the fantastic recipe!! Well, I tried out the recipe and I think the thick cheesecake topping makes it rather difficult to determine when the brownies are done. You can’t just stick a knife in it because the cream cheese and jelly will just make the knife gooey. Good brownie recipe, but the cheesecake topping was a bit much IMO. I LOVE your blog, it’s my absolute fave! Made these last night for a strolling lunch today…they are really tasty! I make my own raspberry jam, so I always have some in the pantry. The recipe is a cinch to make, too. Thanks! I made these for my boyfriend and he ate the whole pan in a span of 24 hours (minus the two that I had). He could not stop talking about how amazing they were! And, boy were they. I don’t think I’ve ever baked something so tasty before! The only thing was that it took about an hour for them to cook, rather than the 35-40 minutes the recipe calls for. Otherwise, fantastic!!! another great recipe. made these yesterday…and now i try very hard to not run down into the kitchen every 5 minutes to grab another piece 🙂 delish!!! Drop dollops of raspberry preserves into the cheesecake batter. Gently swirl batters with a butter knife, giving the brownies a swirly look. Do you use semi sweet dark chocolate or unsweet? Or should I use regular sweetened dark chocolate?